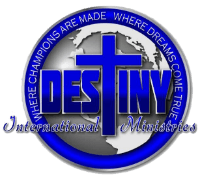 Destiny was founded on November 15, 2001 with nine members and a word from the Lord that said, "Build Me a ministry that will teach My people how to identify and birth the destiny that I have purposed for them." Pittsburgh's Lincoln-Lemington neighborhood. If you want a church with solid biblical teaching, where the Word of God and the things of God are not compromised and that is committed to bring the unsaved into a saving relationship with Jesus Christ, we encourage you to pray. If it is God's will we welcome you to Destiny International Ministries.